Rent Red's Roadhouse | Corporate Events | Wedding Locations, Event Spaces and Party Venues. We are your party place for your birthday, reunion, graduation, fundraiser, quinceanera, rehearsal dinner, engagement party and much more! With our famous half of a vintage car, retro toy collection and carnival lit sign, the DeSoto room is perfect for smaller parties looking for a funky vibe. The room comfortably seats 80 guests. With three industrial sized garage doors the perfect shade of grey, these functional doors can open and close to create a funky indoor/outdoor space (weather permitting.) The Garage also has a private bar and an elevated stage for your favorite band to play your favorite tunes. The room comfortably seats 120 guests. Our largest indoor room has a smooth vintage vibe complete with a full size airstream trailer and antique cars on display. The room boasts a fully stocked 30ft cedar bar and a stage carved right out of the airstream ready for live music and your guests to dance the night away. The room comfortably seats 300 and can hold up to 350 guests. Throwing big old fashion party with lots of guests? The patio is your party place. 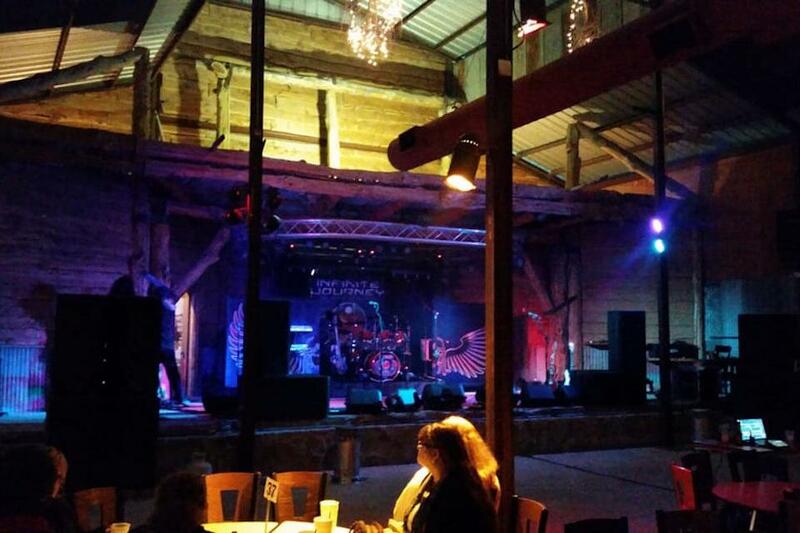 The spacious Texas-sized covered patio is multi level and has its own fully stocked 30' bar, a two story cedar log stage perfect for a band or ceremony site, a 2,000 square foot dance floor and a towering stone fireplace. The entire patio can accommodate up to 400 seated guests. The upper patio can be rented alone, which can accommodate up to 120 seated guests. Dreaming of having your ceremony outdoors under the Texas stars? The quaint cedar post arbor is the perfect backdrop for your vows as it twinkles at night. Guests line the flagstone path for your grand entrance as you step towards happily ever after. You also have the flexibility of adding flowers, greenery or draping the arbor with sheer fabric. It is your day and we are here to make sure it is picture perfect. The garden comfortably seats 200 guests.